There are notable Philippine heroes who have fought for freedom and independence of their country. One person who had extraordinary patriotism was Ninoy Aquino. Born as Benigno Simeon "Ninoy" Aquino, Jr. on November 27, 1932, he held various government positions before his assassination in August 21, 1983. He became a Philippine Senator, Governor of Tarlac, and an opposition leader against President Ferdinand Marcos. He was assassinated at the Manila International Airport upon returning home from exile in the United States. Ninoy Aquino became the youngest municipal mayor at age 22, and the nation's youngest vice-governor at 27. He became governor of Tarlac province in 1961 at age 29, then secretary-general of the Liberal Party in 1966. In 1967 he made history by becoming the youngest elected senator in the country's history at age 34. He was the only "survivor" of the Liberal Party who made it to the senate, where he was inevitably singled out by Marcos and his allies as their greatest threat. It was not until the Plaza Miranda bombing however—on August 21, 1971, that the pattern of direct confrontation between Marcos and Aquino emerged. At 9:15 p.m., at the kick-off rally of the Liberal Party, the candidates had formed a line on a makeshift platform and were raising their hands as the crowd applauded. The band played, a fireworks display drew all eyes, when suddenly there were two loud explosions that obviously were not part of the show. In an instant the stage became a scene of wild carnage. The police later discovered two fragmentation grenades that had been thrown at the stage by "unknown persons". Eight people died, and 120 others were wounded, many critically. Ninoy Aquino was absent during the incident. President Marcos declared martial law on September 21, 1972 and he went on air to broadcast his declaration on midnight of September 23. Aquino was one of the first to be arrested and imprisoned on trumped-up charges of murder, illegal possession of firearms and subversion. On April 4, 1975, Ninoy Aquino announced that he was going on a hunger strike, a fast to the death to protest the injustices of his military trial. Ten days through his hunger strike, he instructed his lawyers to withdraw all motions he had submitted to the Supreme Court. As weeks went by, he subsisted solely on salt tablets, sodium bicarbonate, amino acids, and two glasses of water a day. Even as he grew weaker, suffering from chills and cramps, soldiers forcibly dragged him to the military tribunal's session. His family and hundreds of friends and supporters heard Mass nightly at the Santuario de San José in Greenhills, San Juan, praying for his survival. Near the end, Aquino's weight had dropped from 54 to 36 kilos. Aquino nonetheless was able to walk throughout his ordeal. On May 13, 1975, on the 40th day, his family and several priests and friends, begged him to end his fast, pointing out that even Christ fasted only for 40 days. He acquiesced, confident that he had made a symbolic gesture. But he remained in prison, and the trial continued, drawn out for several years. On November 25, 1977, the Commission found Ninoy Aquino guilty of all charges and sentenced him to death by firing squad. However, Aquino and many others believed that Marcos, ever the shrewd strategist, would not let him suffer a death that would surely make Aquino a martyr. In mid-March 1980, Ninoy Aquino suffered a heart attack, possibly the result of seven years in prison, mostly in a solitary cell which must have taken a heavy toll on his gregarious personality. He was transported to the Philippine Heart Center where he suffered a second heart attack. ECG and other tests showed that he had a blocked artery. Philippine surgeons were reluctant to do a coronary bypass because it could involve them in a controversy. Additionally, Ninoy Aquino refused to submit himself to Philippine doctors, fearing possible Marcos "duplicity"; he preferred to go to the United States for the procedure or else return to his cell at Fort Bonifacio and die. Aquino was operated on at a hospital in Dallas, Texas. He made a quick recovery, was walking within two weeks and making plans to fly to Damascus, Syria to meet with Muslim leaders, which he did five weeks later. When he reiterated that he was returning to the Philippines, he received a surreptitious message from the Marcos government saying that he was now granted an extension of his "medical furlough". Eventually, Aquino decided to renounce his two covenants with Malacañang "because of the dictates of higher national interest". After all, Aquino added, "a pact with the devil is no pact at all". Aquino spent three years in self-exile, living with his family in Newton, Massachusetts, a suburb of Boston. On fellowship grants from Harvard University and the Massachusetts Institute of Technology, he worked on the manuscripts of two books and gave a series of lectures in school halls, classrooms and auditoriums. He traveled extensively in the U.S. delivering speeches critical of the Marcos government. Aquino decided to go back to the Philippines, fully aware of the dangers that awaited him. Warned that he would either be imprisoned or killed, Aquino answered, "if it's my fate to die by an assassin's bullet, so be it. But I cannot be petrified by inaction, or fear of assassination, and therefore stay in the side... His family, however, learned from a Philippine Consulate official that there were orders from Ministry of Foreign Affairs not to issue any passports for them. At that time, their visas had expired and their renewal had been denied. They therefore formulated a plan for Ninoy to fly alone with the rest of the family to follow him after two weeks. Despite the government's ban on issuing him a passport, Aquino acquired one with the help of Rashid Lucman, a former Mindanao legislator and founder of the Bangsamoro Liberation Front. It carried the alias Marcial Bonifacio (Marcial for martial law and Bonifacio for Fort Bonifacio, his erstwhile prison). He eventually obtained a legitimate passport from a sympathizer working in a Philippine consulate. The Marcos government warned all international airlines that they would be denied landing rights and forced to return if they tried to fly Ninoy to the Philippines. Aquino insisted that it was his natural right as a citizen to come back to his homeland, and that no government could prevent him from doing so. He left Logan International Airport on August 13, 1983, took a circuitous route home from Boston, via Los Angeles to Singapore. Ninoy Aquino then left for Hong Kong and on to Taipei. He had chosen Taipei as the final stopover when he learned the Philippines had severed diplomatic ties with the Republic of China (Taiwan). This made him feel more secure; the Taiwan authorities could pretend they were not aware of his presence. There would also be a couple of Taiwanese friends accompanying him. From Taipei he flew to Manila on China Airlines Flight 811. 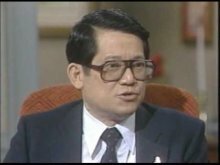 Marcos wanted Aquino to stay out of politics, however Ninoy Aquino asserted his willingness to suffer the consequences declaring, "the Filipino is worth dying for." He wished to express an earnest plea for Marcos to step down, for a peaceful regime change and a return to democratic institutions. Anticipating the worst, at an interview in his suite at the Taipei Grand Hotel, he revealed that he would be wearing a bullet-proof vest, but he also said that "it's only good for the body, but for the head there's nothing else we can do." Sensing his own doom, he told the journalists accompanying him on the flight, "You have to be ready with your hand camera because this action can become very fast. In a matter of 3 or 4 minutes it could be all over, and I may not be able to talk to you again after this." In his last formal statement that he wasn't able to deliver, he said, "I have returned to join the ranks of those struggling to restore our rights and freedom through nonviolence. I seek no confrontation." Ninoy Aquino was assassinated on August 21, 1983 when he was shot in the head after returning to the country. At the time, bodyguards were assigned to him by the Marcos government. A subsequent investigation produced controversy but produced no definitive results. After the Marcos government was overthrown, another investigation found sixteen defendants guilty. They were all sentenced to life in prison. Over the years, some were released, and the last one was let out in March 2009. In Senator Aquino's honor, the Manila International Airport (MIA) where he was assassinated was renamed Ninoy Aquino International Airport (NAIA) and his image is printed on the 500-peso bill. August 21, the anniversary of his death, is "Ninoy Aquino Day", an annual public holiday in the Philippines. Several monuments were built in his honor. Most renowned is the bronze memorial in Makati City near the Philippine Stock Exchange, which today is a venue of endless anti-government rallies and large demonstrations. Another one bronze statue is in front of the Municipal Building of Concepcion, Tarlac.